The Sunset Cruises And Pampering Spa Treatments Await Travelers To Grand Lido Resort & Spa In Negril, Jamaica. The all-inclusive resort faces bloody bay and 200 yards of sandy white beach. 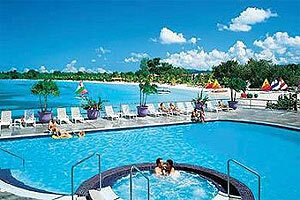 The resort is 55 miles west of Montego Bay and approximately 90 minutes from the Montego Bay airport. Spacious grounds display mango trees, flowering gardens, and striking tropical ambiance. Guests are greeted with a champagne toast and rose-scented towels as they marvel at the enormous marble lobby. By day, Grand Lido Negril is an active, outdoor playground, with spirited island music, live entertainment, spectacular tennis and an endless array of water sports like windsurfing, snorkeling and kayaking. Isolated from the rest of the resort is a clothing-optional beach. Guests interested in escaping the hot sun enjoy backgammon, dominoes and table tennis.